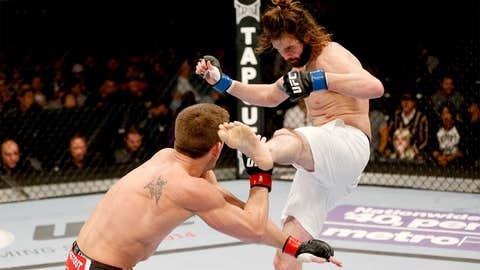 Cody McKenzie wore an interesting pair of shorts at UFC on FOX. "That’s one of the weirdest things I’ve ever seen, and it’s even weirder that we let it happen," White said at the press conference following UFC on FOX: Johnson vs. Benavidez. Kevin Iole of Yahoo! tweeted that McKenzie forgot his actual fight shorts at the hotel and someone had to run and pick up a pair across the street or his fight with Sam Stout would have been delayed. That information came from Andy Foster, the California State Athletic Commission executive director. Stout ended up beating McKenzie by unanimous decision. As if things couldn’t get any stranger, McKenzie wrote ‘907’ in black marker on the shorts. That’s the area code where the ‘Ultimate Fighter’ alum is from in Alaska. So he’s the Aleutian Nick Diaz now. Las Vegas Review-Journal reporter Adam Hill tweeted that McKenzie self-medicated himself after the fight with two shots and some beer, which he spit up on himself. McKenzie (14-4) is either the hero we don’t deserve or about to get cut from the UFC. "Pretty embarrassing," White said. "I could not be more embarrassed by this. I don’t even know what to say. We’re stupid. I was pissed."